Through Education, Volunteerism, Long-term Planning and Supportive Funding. The Ancient Oaks Foundation is a 501(c)(3) charitable foundation dedicated to the preservation and restoration of the Lake Zurich area’s oak woodlands and natural areas. Restore and preserve natural areas by decreasing invasive species and reintroducing native vegetation. Educate the community on the care of natural areas and the benefits for future generations. Encourage community involvement through activities, volunteerism and AOF membership or sponsorship. Develop sustainable, long term plans for the care of natural areas. Check out our upcoming events designed to educate residents, both kids and adults, on nature in our surrounding areas. We are thankful for our donors – individuals, families, and corporations – who see the value in preserving our hometown natural areas. We love our volunteers and supporters. Find out how you can support Ancient Oaks Foundation. Help preserve our hometown natural areas. Show your support with an individual, family or corporate membership or give a one time donation to Ancient Oaks Foundation. 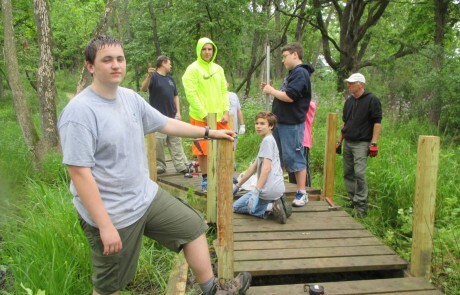 Take pride in supporting Lake Zurich Area’s only local conservation group! Boardwalk before(l) and after(r) restoration. The area is now full of sunlight and flowers are thriving. Justin G added handrails on the boardwalk to make it safer.